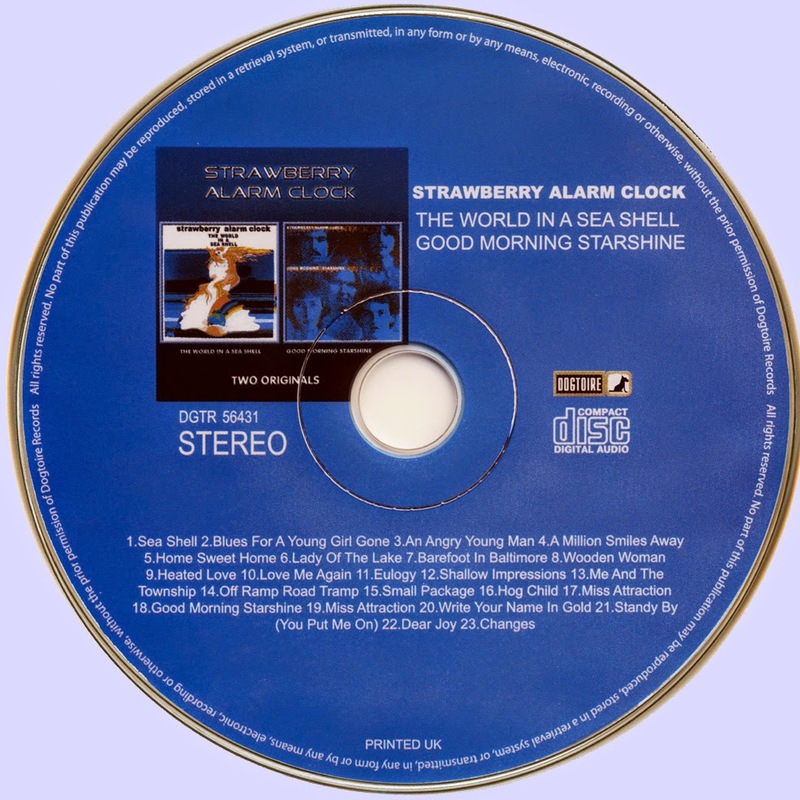 When the Strawberry Alarm Clock recorded their third album in 1968, they were struggling to regain the phenomenal success they'd enjoyed in late 1967, when "Incense and Peppermints" shot to the top of the charts and their debut album of the same name stopped just outside the Top Ten. Despite featuring a Top Forty single in "Tomorrow," their second album, Wake Up...It's Tomorrow (also reissued on CD by Collectors' Choice Music), had failed to chart at all. There had always been a number of musical directions at work in the band, but The World in a Seashell found them torn between their own brand of psychedelic pop and record company-instigated attempts to move them toward a softer, more orchestrated pop approach. Dissatisfied with the group's recent output, the UNI label brought in some outside writers for the album. Also added to the recipe were some string arrangements by George Tipton, who also worked in the 1960s on recordings by Sam Cooke, Jackie DeShannon, the Sunshine Company, the Monkees, Nilsson, and others. "What they probably didn't like," speculates keyboardist Mark Weitz, "was that we wrote and arranged our own songs -- some of which, the lyrics were not to their approval. [Tipton] was brought in on the third album to try our luck on recording some original songs written by popular songwriters like Carole King. I guess UNI thought it might help us get on the charts again." But as so often happens when the bean-counters try to over-egg the pudding, "eventually we found out that it practically ruined our following. The songs weren't us! They weren't strong enough! I think it hurt our image drastically -- like we were 'selling out' to the 'Suits' and going soft rock." Two of the songs penned on their behalf, "Sea Shell" and "Home Sweet Home," were by the team of John Carter and Tim Gilbert, the same duo whose songwriting credits had been attached to "Incense and Peppermints." Weitz backtracks here to explain why he was not exactly the best of buddies with Carter, despite the massive success of that hit single: "John Carter was a writer, a musician friend of Frank Slay's [who co-produced the Strawberry Alarm Clock with the band's manager, Bill Holmes], from a group called the Rainy Daze out of Colorado Springs. Slay produced them and had a novelty record released of theirs, 'That Acapulco Gold.' It had some L.A. airplay [in fact it made #70 on the national charts] until it was pulled because of the lyric content. Tim Gilbert was also in the same band, but I heard that he really didn't have much to do with the lyric writing; it was mainly Carter." Back before the Strawberry Alarm Clock were even on UNI, they'd recorded a backing track to the song that eventually became "Incense and Peppermints." Guitarist Ed King writes on his website (www.ed-king.com) that "Mark Weitz wrote the bulk of the music and I wrote the bridge. We didn't have lyrics." Slay then mailed a small two-track reel of tape with the recording to Carter back in Colorado. Carter, Weitz continues, "mailed the tape back to Slay. Slay called us into a meeting in his office in Hollywood on Sunset Boulevard, and played the tape of Carter playing an acoustic guitar (of my music!) and singing [his] lyrics along with it. Carter from then on was not my friend! As well as Slay, and Holmes. John Carter showed up later on the third album submitting songs for us to play, probably through Frank Slay of course. Carter was not involved in the second album because it was too soon after the ripoff of 'Incense and Peppermints.' I guess he ducked out of sight until things cooled off! "By the way, Bill Holmes had something to do with that ripoff also. He fought with Slay just before label printing. Holmes wanted all of the members' names on the record as writers, because he felt that all band members had something to do with the overall song. Slay asked him to pick only four names, which was the maximum limit that was allowed to be associated with a song -- according to Frank Slay. Holmes wouldn't back down on his request, so, as I heard it, Slay sent it to label printing with Carter and Gilbert's names alone. Leaving Weitz and King off! Slay's response when questioned was there was no melody line, and that without a melody line the lyricist gets the credit! That was the lamest response I have ever heard. And he was emphatic about the answer too! So this was now a toxic working environment -- a producer and manager that could not be trusted! Without [us] noticing at the time, it was probably the precursor to the ultimate demise of the Alarm Clock." A rather more famous writer than Carter contributed to a couple of the other non-band compositions, "Blues for a Young Girl Gone" and "Lady of the Lake," both of which were co-written by Carole King and Toni Stern. "We were not in love with those songs," admits Weitz. "But, they were a challenge. Orchestra and all, we had to rise to the occasion. There was a lot of pressure on those sessions not to make any mistakes. We were playing alongside some accomplished studio horn [players] and violinists that were twice our age in experience. It was pretty tense for us; we were not used to playing live with orchestrations simultaneously. It was harder than any of the studio recording we had done thus far. The masters turned out great." By the time the Strawberry Alarm Clock made their fourth and final album in 1969, the group had changed considerably in both lineup and sound from the one that recorded "Incense and Peppermints." Considering what was going on behind the scenes, in fact, it's something of a surprise that the band were even able to survive as an act, let alone make it into the recording studio. When they did cut their final LP, a new lead singer and new bluesy hard rock direction resulted in some music that was far afield from their earlier albums and singles, though much of their idiosyncratic brand of psychedelic pop remained on some of the tracks. The musical chairs started when drummer Randy Seol and bassist George Bunnell, who'd both been aboard for the band's first three LPs, left near the end of 1968 after the group's third album, The World in a Seashell. Confusingly, it wasn't quite the end of their time playing under the name Strawberry Alarm Clock. A much more famous hit single by the Beach Boys (with whom the Strawberry Alarm Clock toured in 1967 and 1968), incidentally, is quoted elsewhere on the album on the tag of "Small Package." "I had the idea to do that 'California Girls' ending," says Weitz. "The key we were playing in was perfect -- it just flowed into it. We had been on tour when they played that song, it was in my mind, and I just started playing it during rehearsal on the Hammond B-3 I was using on that song, just for fun. We kept it in. Jimmy and I did the harmony at the ending fadeout." 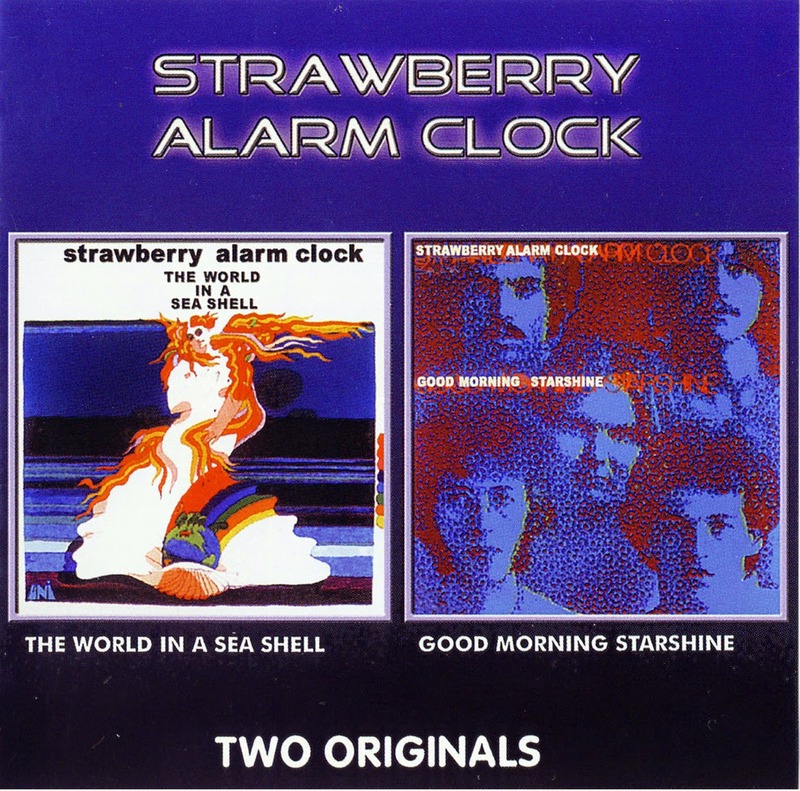 The Good Morning Sunshine album, like all Strawberry Alarm Clock LPs save the first, failed to chart. Although a few singles on UNI (as well as an appearance in the movie Beyond the Valley of the Dolls) would follow in 1969 and 1970, the band never regained their initial popularity. "None of the singles we recorded [after Good Morning Sunshine] were smash hits," Weitz recalls. "I'm not blaming UNI, don't get me wrong, we really did try. We just didn't have a mouth-watering hit on our hands, and knew it was inevitable that they were going to lose interest." In fact, the lineup that had recorded Good Morning Starshine didn't even last too long. Pitman left in mid-1969, with Paul Marshall coming in as lead singer and King switching back to lead guitar. Looking back on the Strawberry Alarm Clock's career, Weitz and King agree that the band often didn't gel and work well together. Remarks Weitz, "There was always difference of opinions on what songs should get recorded, whose material was better, and not liking how the other member was playing a part of the song -- stuff like that. Randy and George sometimes had totally different ideas about songwriting. Some of us didn't like their stuff, and sometimes they didn't like ours. Also, I was always trying to keep the band in line -- you know, more serious. They were only eighteen and had very little discipline as far as how they behaved on the road -- like NOT professional. I liked to laugh and have a good time too, but not to their extent. They didn't like that. I just always felt I was more serious about everything when it came to music. They wanted me to lighten up." King feels that the third and fourth albums in particular "were pieced together and there was no unity anywhere about the content. Actually, the only unity that existed was on the first album. But the second album 'sounded' better. I haven't had the chance to listen to these records yet. However, I just wanted to say thank you Marios, for making these two albums available again so quickly.